Importance of Civil Engineering in the Modern World. What Civil Engineering is all about? Civil Engineering studies the science of building and designing bridges, roads, highways etc. It is a profession where people namely civil engineers build dams, bridges, water systems, highways and other buildings. They are expected to find creative ways in which they can improve the infrastructure of their construction through the changes in climate, increased urbanization and drought. The use of Civil engineering is considered to be the oldest engineering discipline. What Are The Branches Of Engineering? Construction Engineering- The concept of Construction Engineering was introduced in 1963 at Iowa State University. The Construction Engineering is about planning, managing and constructing the infrastructures such as bridges, highways, airports, railroads etc. The construction engineering requires the involvement of hydraulic, transportation, environmental, geotechnical, site development and structural engineers for executing the designs. The construction engineers are considered to be the problem solvers. They help in creating infrastructures that meet the demands of its environment. A construction engineer must have a precise knowledge of maths, science, communication, time management, analytical thinking etc. Transportation Engineering- Transportation Engineering aims at applying technology and scientific principles to the management, planning, operation and functional design for making the modes of transportation comfortable, rapid, safe, economical and compatible with the environment. Before proceeding on their plans, the engineers must inspect the area taking accounts of its population, economic activities, land use, community expectations and values, travel patterns, transportation services and facilities, laws etc. Water Resource Engineering- The water Resource Engineering is introduced to design new systems and equipment that contributes in helping the human water resources. It requires the knowledge of meteorology, hydraulic and geology. The water resource engineers help implanting underground water wells, water treatment facilities and natural springs. Earthquake Engineering- The lives and properties of people are greatly influenced by the Earthquake Engineering which is a sub-discipline of Civil Engineering. It is used to lessen the chances of damage caused by earthquakes. The main aim of earthquake engineering is to keep in mind the building codes and accord them with the buildings in order to lower the risks of damage. Environmental Engineering- Environmental engineering helps in giving protection to the people from unfavorable environmental effects like pollution, global warming etc. The environmental engineers improve the environment friendly measures such as waste disposal, recycling, water pollution control, air pollution control and public health. The environmental engineering came into existence ever since the need of conserving the environment has taken place. If the air, water and soil are contaminated, the living conditions cannot grow for better. 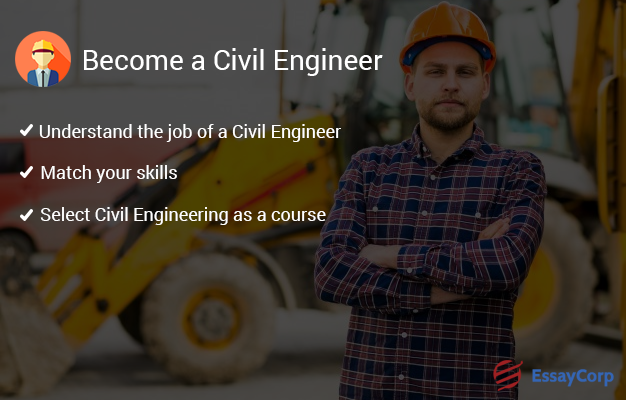 What Should Be Done To Become A Civil Engineer? Understand The Job Of A Civil Engineer- For pursuing any subject you must have a complete knowledge of it. Different subjects have different teachings. What is the definition of Civil Engineering? Civil Engineering is a subject that deals with planning, designing, constructing and maintaining public works. Civil engineers work on different fields such as environmental engineering, transportation engineering, water resource engineering etc. The USA Civil Engineering also has a field of Military Engineering. Match your skills- Civil Engineering requires good academic and a lot of other skills. It requires a good science and mathematical skill, designing skill, time management skill, supervision skill, creativity skill etc. The most important skill that it requires is the ability to think about a “big picture” and work as a team. Sometimes it may require to work without supervision where you have to create and construct without any guidance. So, you need to be sure whether you have these qualities or not, the Civil Engineering comes with a social responsibility as well so you have to be sure and determined before pursuing it. Select Civil Engineering as a course– When you have crossed the previous two steps, it is time to take Civil Engineering up as a subject. Find the best schools for Civil Engineering and get yourself enrolled. Select a programme that interests you the most. Civil Engineering has different fields like earthquake engineering, environmental engineering, water resource engineering etc. Once you are done with your course, do an internship and you are all set to work in the field of Civil Engineering. In the modern world, the importance of Civil Engineering has been given a huge upheaval as people always want unique and advance up gradation of techniques. Today looking at our surroundings in a metropolitan city, the contribution of Civil Engineering is something which is highly appreciated. Although, no matter how modern the work requires to be, the safety of people and environment should not be compromised.